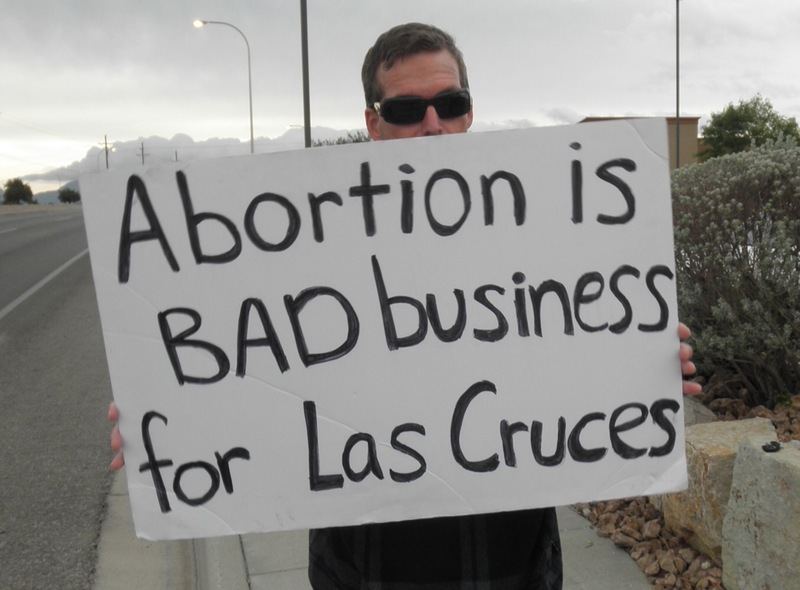 Wednesday evening, I went up Lohman Ave. here in Las Cruces to a demonstration on the sidewalk in front of Dion’s restaurant, near the location of an abortion clinic due to open in town. The demonstration, a pro-life initiative affiliated with the national 40 Days For Life Project, will actually be going on for 50 days here through November 2. For 16 hours every day, volunteers will be in place, holding signs and making their presence, views and convictions about abortion known, but there is another aspect to this that sets it apart from most other demonstrations. 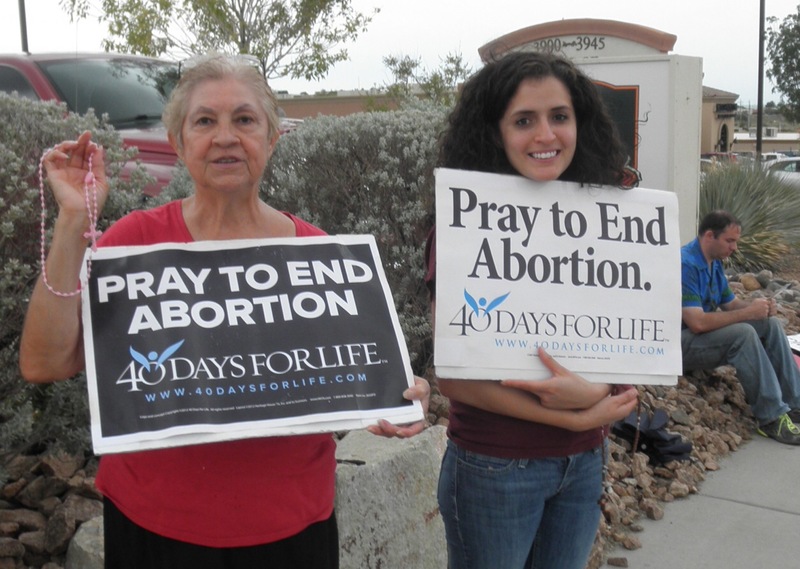 The volunteers are engaged in prayer; prayer for women considering abortion, workers at abortion clinics, our leaders on every level and especially for the unborn children who are in mortal danger whenever a pregnant woman walks into one of these clinics. At the start of this event on Sunday, there were over 200 people of many different faith-based denominations and many church leaders from many different churches who came out in support of this cause. The main thing these people have in common is a conviction grounded in their faith that abortion is wrong, is the killing of innocent children in the womb and that it has no place in our home town. Catholics and Protestants of all types are standing side by side, unified in principle and prayer. 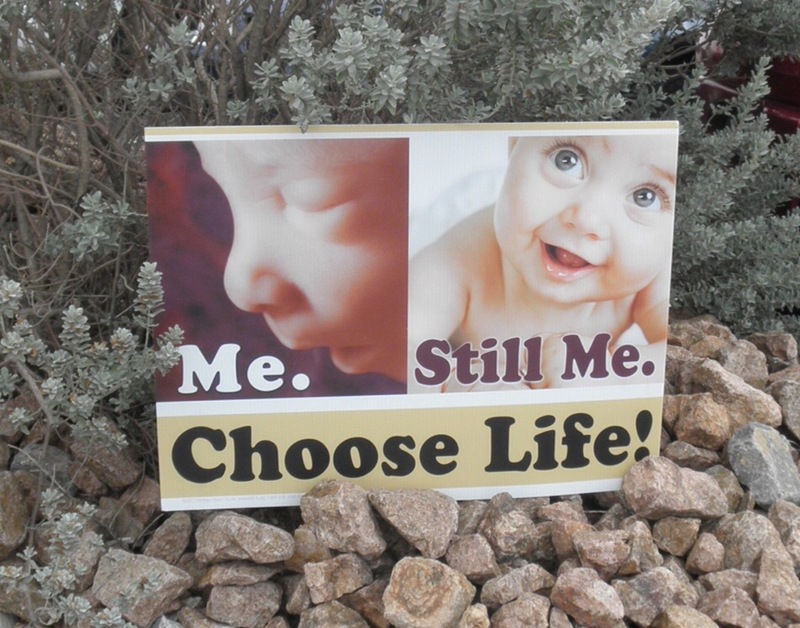 On Wednesday, I met a woman there named Mickey, a soft-spoken lady with an easy smile and the light of love in her eyes that made it immediately clear to me that, when she spoke about wanting to save the lives of the unborn, it was coming straight from her heart. I thought about the accusations that will inevitably be thrown at these people, mainly that the pro-life crowd is a bunch of bullies trying to force and control women. I suspect that, if they were capable of letting go of their venom and anger for just five minutes to talk to someone like Mickey, they’d realize how empty those accusations actually are. She was holding a sign that read, “Pray To End Abortion” and also a pink rosary. She and several others had been praying the Rosary, one man was going though the Stations of the Cross and another was holding a sign while engaged in deep prayer. Mickey spoke to me about God’s love for these unborn children and also of His love for the women carrying these children and the workers at the abortion clinics. She talked about her love for them, as well. She told me how abortion causes nothing but pain and damage and death and how she can’t understand how so many people shut their eyes tight and ignore it all, hiding behind the false banners of choice and freedom. I heard the pain in her words, but also a strong, quiet conviction when she told me that she knew that God would not abandon them in their efforts; that He would be right there and bless their cause because they were being true to His teachings and to the cause of protecting innocent life. If you want to see the faces of true warriors, all you have to do is go out to one of these events. They are taking place in countless cities across the nation. In New Mexico, there are events in Las Cruces, Albuquerque and Rio Rancho. For specific information on 40 Days For Life, go to 40daysforlife.com. Meet these people, talk with them and pray with them and you’ll find yourself in the midst of people who take the principles of their faith very seriously. For a Christian, taking a stand like this first means submission; submission to God’s will and to the principles laid out in scripture. It means doing things that are hard and unpopular and that require sacrifice. These people are committed to doing what’s right under any conditions. For 16 hours every day, these people are on that sidewalk, no matter what the weather…and we’ve been getting a lot of rain this week. It’s not the worst thing in the world to be exposed to, but try standing out in the rain for 15 minutes. It will take it’s toll on you very quickly. They are setting aside their personal wants and comfort in order to serve a higher cause: the saving of human life. With over a million abortions being performed in the United States every year* and a more and more permissive attitude toward the ending of life en utero, it qualifies in my mind as an epidemic that is in desperate need of attention and in desperate need of people willing to stand up for those who cannot stand up for themselves. These people have done that and continue to. Although they are claiming ‘logistics issues’, the fact is that the abortion clinic that was set to open last Monday has still, as of today, never opened its doors yet. You can blame it on coincidence if you like, but the truth is, when people of conviction and principle stand up to be counted, especially those whose faith shines so brightly in the dark…and the rain, others take notice and things do change. Keep watching these groups as the official 40 Days starts very shortly. This is how positive change happens. * from the Guttmacher Institute and the Centers For Disease Control 2013 numbers.